Cell potency is a cell's ability to differentiate into other cell types. The more cell types a cell can differentiate into, the greater its potency. Potency is also described as the gene activation potential within a cell, which like a continuum, begins with totipotency to designate a cell with the most differentiation potential, pluripotency, multipotency, oligopotency, and finally unipotency. In biology, a blastomere is a type of cell produced by cleavage of the zygote after fertilization and is an essential part of blastula formation. Chromatin is a complex of DNA, RNA, and protein found in eukaryotic cells. Its primary function is packaging very long DNA molecules into a more compact, denser shape, which prevents the strands from becoming tangled and plays important roles in reinforcing the DNA during cell division, preventing DNA damage, and regulating gene expression and DNA replication. During mitosis and meiosis, chromatin facilitates proper segregation of the chromosomes in anaphase; the characteristic shapes of chromosomes visible during this stage are the result of DNA being coiled into highly condensed networks of chromatin. The human development model is one which can be used to describe how totipotent cells arise. Human development begins when a sperm fertilizes an egg and the resulting fertilized egg creates a single totipotent cell, a zygote. 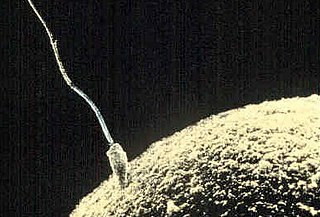 In the first hours after fertilization, this zygote divides into identical totipotent cells, which can later develop into any of the three germ layers of a human (endoderm, mesoderm, or ectoderm), or into cells of the placenta (cytotrophoblast or syncytiotrophoblast). After reaching a 16-cell stage, the totipotent cells of the morula differentiate into cells that will eventually become either the blastocyst's Inner cell mass or the outer trophoblasts. Approximately four days after fertilization and after several cycles of cell division, these totipotent cells begin to specialize. The inner cell mass, the source of embryonic stem cells, becomes pluripotent. A spermatozoon is a motile sperm cell, or moving form of the haploid cell that is the male gamete. A spermatozoon joins an ovum to form a zygote. Post-transcriptional regulation is the control of gene expression at the RNA level, therefore between the transcription and the translation of the gene. It contributes substantially to gene expression regulation across human tissues. The zebrafish is a freshwater fish belonging to the minnow family (Cyprinidae) of the order Cypriniformes. Native to South Asia, it is a popular aquarium fish, frequently sold under the trade name zebra danio. The zebrafish is also an important and widely used vertebrate model organism in scientific research, for example in drug development, in particular pre-clinical development. It is also notable for its regenerative abilities, and has been modified by researchers to produce many transgenic strains. DNA demethylation is the process of removal of a methyl group from nucleotides in DNA. Both DNA demethylation and methylation play important roles in mammalian development and differentiation, as well as in cognition and neuroregeneration. DNA methylation on cytosine at CpG sites on a gene promoter leads to the silencing of gene expression, while DNA demethylation of a gene promoter is linked to transcriptional activation and gene expression. These are called epigenetic changes. The DNA methylation status that controls gene expression is copied during DNA replication and is transmitted to daughter cells along with the DNA sequence. This area is currently being investigated for its role in disease progression and for potential treatments, such as cancer therapy. Base excision repair (BER) is a cellular mechanism, studied in the fields of biochemistry and genetics, that repairs damaged DNA throughout the cell cycle. It is responsible primarily for removing small, non-helix-distorting base lesions from the genome. The related nucleotide excision repair pathway repairs bulky helix-distorting lesions. BER is important for removing damaged bases that could otherwise cause mutations by mispairing or lead to breaks in DNA during replication. BER is initiated by DNA glycosylases, which recognize and remove specific damaged or inappropriate bases, forming AP sites. These are then cleaved by an AP endonuclease. The resulting single-strand break can then be processed by either short-patch or long-patch BER. In cell biology, pluripotency (Lat. 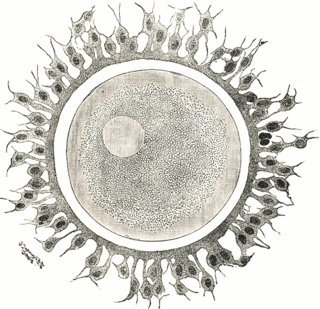 pluripotentia, "ability for many [things]")  refers to a stem cell that has the potential to differentiate into any of the three germ layers: endoderm (interior stomach lining, gastrointestinal tract, the lungs), mesoderm (muscle, bone, blood, urogenital), or ectoderm (epidermal tissues and nervous system). However, cell pluripotency is a continuum, ranging from the completely pluripotent cell that can form every cell of the embryo proper, e.g., embryonic stem cells and iPSCs (see below), to the incompletely or partially pluripotent cell that can form cells of all three germ layers but that may not exhibit all the characteristics of completely pluripotent cells. Due to their great similarity to ESCs, iPSCs have been of great interest to the medical and research community. iPSCs could potentially have the same therapeutic implications and applications as ESCs but without the controversial use of embryos in the process, a topic of great bioethical debate. In fact, the induced pluripotency of somatic cells into undifferentiated iPS cells was originally hailed as the end of the controversial use of embryonic stem cells. However, iPSCs were found to be potentially tumorigenic, and, despite advances,  were never approved for clinical stage research in the United States. Setbacks such as low replication rates and early senescence have also been encountered when making iPSCs,  hindering their use as ESCs replacements. Additionally, it has been determined that the somatic expression of combined transcription factors can directly induce other defined somatic cell fates (transdifferentiation); researchers identified three neural-lineage-specific transcription factors that could directly convert mouse fibroblasts (skin cells) into fully functional neurons. This result challenges the terminal nature of cellular differentiation and the integrity of lineage commitment; and implies that with the proper tools, all cells are totipotent and may form all kinds of tissue. In biology, oligopotency is the ability of progenitor cells to differentiate into a few cell types. It is a degree of potency. 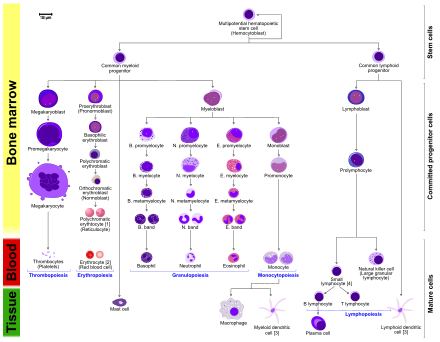 Examples of oligopotent stem cells are the lymphoid or myeloid stem cells. A lymphoid cell specifically, can give rise to various blood cells such as B and T cells, however, not to a different blood cell type like a red blood cell. Examples of progenitor cells are vascular stem cells that have the capacity to become both endothelial or smooth muscle cells. In cell biology, a unipotent cell is the concept that one stem cell has the capacity to differentiate into only one cell type. It is currently unclear if true unipotent stem cells exist. Hepatoblasts, which differentiate into hepatocytes (which constitute most of the liver) or cholangiocytes (epithelial cells of the bile duct), are bipotent. A close synonym for unipotent cell is precursor cell. A germ cell is any biological cell that gives rise to the gametes of an organism that reproduces sexually. In many animals, the germ cells originate in the primitive streak and migrate via the gut of an embryo to the developing gonads. There, they undergo meiosis, followed by cellular differentiation into mature gametes, either eggs or sperm. 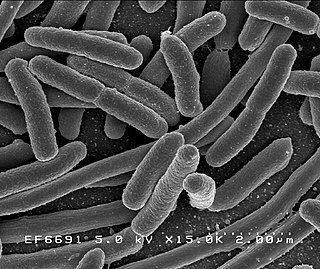 Unlike animals, plants do not have germ cells designated in early development. Instead, germ cells can arise from somatic cells in the adult. Oct-4, also known as POU5F1, is a protein that in humans is encoded by the POU5F1 gene. Oct-4 is a homeodomain transcription factor of the POU family. It is critically involved in the self-renewal of undifferentiated embryonic stem cells. As such, it is frequently used as a marker for undifferentiated cells. Oct-4 expression must be closely regulated; too much or too little will cause differentiation of the cells. Gametogonium are stem cells for gametes located within the gonads. They originate from primordial germ cells, which have migrated to the gonads. Male gametogonia which are located within the testes during development and adulthood are called spermatogonium. Female gametogonia, known as oogonium, are found within the ovaries of the developing foetus and were thought to be depleted at or after birth. Spermatogonia and oogonia are classified as sexually differentiated germ cells. Homeobox protein NANOG is a transcriptional factor that helps embryonic stem cells (ESCs) maintain pluripotency by suppressing cell determination factors. Therefore NANOG deletion will trigger differentiation of ESCs. There are many different types of cancer that are associated with NANOG. In humans, this protein is encoded by the NANOG gene. A Muse cell is an endogenous non-cancerous pluripotent stem cell. They reside in the connective tissue of nearly every organ, bone marrow and peripheral blood. They are collectable from commercially obtainable mesenchymal cells such as human fibroblasts, bone marrow-mesenchymal stem cells and adipose-derived stem cells. Muse cells are able to generate cells representative of all three germ layers from a single cell both spontaneously and under cytokine induction. Expression of pluripotency genes and triploblastic differentiation are self-renewable over generations. Muse cells do not undergo teratoma formation when transplanted into a host environment in vivo. This can be explained in part by their intrinsically low telomerase activity, eradicating the risk of tumorigenesis through unbridled cell proliferation. They were discovered in 2010 by Mari Dezawa and her research group. An exploratory clinical trial has been started in January 2018, by Life Science Institute, Inc., a group company of Mitsubishi Chemical Holdings company. 1 2 Hans R. Schöler (2007). "The Potential of Stem Cells: An Inventory". In Nikolaus Knoepffler; Dagmar Schipanski; Stefan Lorenz Sorgner. Human biotechnology as Social Challenge. Ashgate Publishing, Ltd. p. 28. ISBN 978-0-7546-5755-2. ↑ "Stem Cell School: Glossary". Archived from the original on 2016-10-07. ↑ Mitalipov S, Wolf D (2009). "Totipotency, pluripotency and nuclear reprogramming". Advances in Biochemical Engineering/Biotechnology. 114: 185–199. Bibcode:2009esc..book..185M. doi:10.1007/10_2008_45. ISBN 978-3-540-88805-5. PMC 2752493 . PMID 19343304. ↑ Lodish, Harvey (2016). Molecular Cell Biology, 8th Ed. W. H. Freeman. pp. 975–977. ISBN 978-1319067748. ↑ "What is the difference between totipotent, pluripotent, and multipotent?". ↑ Western P (2009). "Foetal germ cells: striking the balance between pluripotency and differentiation". Int. J. Dev. Biol. 53 (2–3): 393–409. doi:10.1387/ijdb.082671pw. PMID 19412894. ↑ Sugimoto K, Gordon SP, Meyerowitz EM (April 2011). "Regeneration in plants and animals: dedifferentiation, transdifferentiation, or just differentiation?". Trends Cell Biol. 21 (4): 212–218. doi:10.1016/j.tcb.2010.12.004. PMID 21236679. ↑ Macfarlan T.S. ; Gifford W.D. ; Driscoll S.; Lettieri K.; Rowe H.M.; Bonanomi D.; Firth A.; Singer O.; Trono D. & Pfaff S.L. (2012). "Embryonic stem cell potency fluctuates with endogenous retrovirus activity". Nature. 487: 57–63. Bibcode:2012Natur.487...57M. doi:10.1038/nature11244. PMC 3395470 . PMID 22722858. ↑ Morgani S.M. ; Canham M.A. ; Nichols J.; Sharov A.A.; Migueles R.P. ; Ko M.S. & Brickman J.M. (2013). "Totipotent Embryonic Stem Cells Arise in Ground-State Culture Conditions". Cell Rep. 3: 1945–1957. doi:10.1016/j.celrep.2013.04.034. PMC 3701323 . PMID 23746443. ↑ Ishiuchi T.; Enriquez-Gasca R.; Mizutani E.; Boskovic A.; Ziegler-Birling C.; Rodriguez-Terrones D.; Wakayama T.; Vaquerizas J.M. & Torres-Padilla M.E. (2015). "Early embryonic-like cells are induced by downregulating replication dependent chromatin assembly". Nat Struct Mol Biol. 22 (9): 662–671. doi:10.1038/nsmb.3066. PMID 26237512. ↑ Seydoux G, Braun RE (December 2006). "Pathway to totipotency: lessons from germ cells". Cell. 127 (5): 891–904. doi:10.1016/j.cell.2006.11.016. PMID 17129777. ↑ Asch R, Simerly C, Ord T, Ord VA, Schatten G (July 1995). "The stages at which human fertilization arrests: microtubule and chromosome configurations in inseminated oocytes which failed to complete fertilization and development in humans". Hum. Reprod. 10 (7): 1897–1906. doi:10.1093/oxfordjournals.humrep.a136204. PMID 8583008. ↑ Ciosk, R.; Depalma, Michael; Priess, James R. (10 February 2006). "Translational Regulators Maintain Totipotency in the Caenorhabditis elegans Germline". Science. 311 (5762): 851–853. Bibcode:2006Sci...311..851C. doi:10.1126/science.1122491. PMID 16469927. ↑ Kedde M, Agami R (April 2008). "Interplay between microRNAs and RNA-binding proteins determines developmental processes". Cell Cycle. 7 (7): 899–903. doi:10.4161/cc.7.7.5644. PMID 18414021. ↑ Hajkova P, Jeffries SJ, Lee C, Miller N, Jackson SP, Surani MA (July 2010). "Genome-wide reprogramming in the mouse germ line entails the base excision repair pathway". Science. 329 (5987): 78–82. doi:10.1126/science.1187945. PMC 3863715 . PMID 20595612. ↑ Hackett JA, Sengupta R, Zylicz JJ, Murakami K, Lee C, Down TA, Surani MA (January 2013). "Germline DNA demethylation dynamics and imprint erasure through 5-hydroxymethylcytosine". Science. 339 (6118): 448–52. doi:10.1126/science.1229277. PMC 3847602 . PMID 23223451. ↑ "Biology Online". Biology-Online.org. Retrieved 25 April 2013. ↑ Binder, Marc D.; Hirokawa, Nobutaka; Uwe Windhorst, eds. (2009). Encyclopedia of neuroscience. Berlin: Springer. ISBN 978-3540237358. 1 2 Baker, Monya (2007-12-06). "Adult cells reprogrammed to pluripotency, without tumors". Nature Reports Stem Cells. doi:10.1038/stemcells.2007.124. ↑ Stadtfeld, M.; Hochedlinger, K. (15 October 2010). "Induced pluripotency: history, mechanisms, and applications". Genes & Development. 24 (20): 2239–2263. doi:10.1101/gad.1963910. PMC 2956203 . ↑ Takahashi, Kazutoshi; Yamanaka, Shinya (August 2006). "Induction of Pluripotent Stem Cells from Mouse Embryonic and Adult Fibroblast Cultures by Defined Factors". Cell. 126 (4): 663–676. doi:10.1016/j.cell.2006.07.024. PMID 16904174. ↑ "The Nobel Prize in Physiology or Medicine 2012". Nobelprize.org. Nobel Media AB 2013. Web. 28 Nov 2013. ↑ Takahashi, Kazutoshi; Tanabe, Koji; Ohnuki, Mari; Narita, Megumi; Ichisaka, Tomoko; Tomoda, Kiichiro; Yamanaka, Shinya (1 November 2007). "Induction of Pluripotent Stem Cells from Adult Human Fibroblasts by Defined Factors". Cell. 131 (5): 861–872. doi:10.1016/j.cell.2007.11.019. PMID 18035408. 1 2 Liang, Gaoyang; Zhang, Yi (18 December 2012). "Embryonic stem cell and induced pluripotent stem cell: an epigenetic perspective". Cell Research. 23 (1): 49–69. doi:10.1038/cr.2012.175. PMC 3541668 . PMID 23247625. ↑ Choi, Charles. "Cell-Off: Induced Pluripotent Stem Cells Fall Short of Potential Found in Embryonic Version". Scientific American. Retrieved 25 April 2013. ↑ Vierbuchen T, Ostermeier A, Pang ZP, Kokubu Y, Südhof TC, Wernig M (2010). "Direct conversion of fibroblasts to functional neurons by defined factors". Nature. 463 (7284): 1035–1041. Bibcode:2010Natur.463.1035V. doi:10.1038/nature08797. PMC 2829121 . PMID 20107439. ↑ Park, IH; Lerou, PH; Zhao, R; Huo, H; Daley, GQ (2008). "Generation of human-induced pluripotent stem cells". Nature Protocols. 3 (7): 1180–1186. doi:10.1038/nprot.2008.92. PMID 18600223. ↑ Nichols J, Smith A (2009). "Naive and primed pluripotent states". Cell Stem Cell. 4 (6): 487–492. doi:10.1016/j.stem.2009.05.015. PMID 19497275. ↑ Heard E (2004). 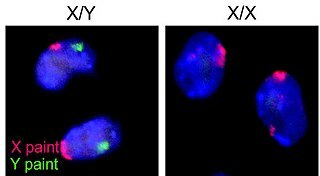 "Recent advances in X-chromosome inactivation". Curr. Opin. Cell Biol. 16 (3): 247–255. doi:10.1016/j.ceb.2004.03.005. PMID 15145348. ↑ Beddington RS, Robertson EJ (1999). "Axis development and early asymmetry in mammals". Cell. 96 (2): 195–209. doi:10.1016/s0092-8674(00)80560-7. PMID 9988215. ↑ Lawson KA, Meneses JJ, Pedersen RA (1991). "Clonal analysis of epiblast fate during germ layer formation in the mouse embryo". Development. 113 (3): 891–911. PMID 1821858. ↑ Rossant J (2008). "Stem cells and early lineage development". Cell. 132 (4): 527–531. doi:10.1016/j.cell.2008.01.039. PMID 18295568. ↑ Brons IG, Smithers LE, Trotter MW, Rugg-Gunn P, Sun B, Chuva de Sousa Lopes SM, Howlett SK, Clarkson A, Ahrlund-Richter L, Pedersen RA, Vallier L (2007). "Derivation of pluripotent epiblast stem cells from mammalian embryos". Nature. 448 (7150): 191–195. Bibcode:2007Natur.448..191B. doi:10.1038/nature05950. PMID 17597762. ↑ Osorno R, Tsakiridis A, Wong F, Cambray N, Economou C, Wilkie R, Blin G, Scotting PJ, Chambers I, Wilson V (2012). "The developmental dismantling of pluripotency is reversed by ectopic Oct4 expression". Development. 139 (13): 2288–2298. doi:10.1242/dev.078071. PMC 3367440 . PMID 22669820. ↑ Giorgetti A, Marchetto MC, Li M, Yu D, Fazzina R, Mu Y, Adamo A, Paramonov I, Cardoso JC, Monasterio MB, Bardy C, Cassiani-Ingoni R, Liu GH, Gage FH, Izpisua Belmonte JC (2012). "Cord blood-derived neuronal cells by ectopic expression of Sox2 and c-Myc". Proc. Natl. Acad. Sci. U.S.A. 109 (31): 12556–61. Bibcode:2012PNAS..10912556G. doi:10.1073/pnas.1209523109. PMC 3412010 . PMID 22814375. ↑ Guan K, Nayernia K, Maier LS, Wagner S, Dressel R, Lee JH, Nolte J, Wolf F, Li M, Engel W, Hasenfuss G (2006). "Pluripotency of spermatogonial stem cells from adult mouse testis". Nature. 440 (7088): 1199–203. Bibcode:2006Natur.440.1199G. doi:10.1038/nature04697. PMID 16565704. ↑ Yong Zhao; Theodore Mazzone (Dec 2010). "Human cord blood stem cells and the journey to a cure for type 1 diabetes". Autoimmun Rev. 10 (2): 103–107. doi:10.1016/j.autrev.2010.08.011. PMID 20728583. ↑ Tallone T; Realini C; Böhmler A; et al. (April 2011). "Adult human adipose tissue contains several types of multipotent cells". J Cardiovasc Transl Res. 4 (2): 200–10. doi:10.1007/s12265-011-9257-3. PMID 21327755. ↑ Beltrami AP; Barlucchi L; Torella D; et al. (September 2003). "Adult cardiac stem cells are multipotent and support myocardial regeneration". Cell. 114 (6): 763–76. doi:10.1016/S0092-8674(03)00687-1. PMID 14505575. ↑ Ohgushi H, Arima N, Taketani T (December 2011). "[Regenerative therapy using allogeneic mesenchymal stem cells]". Nippon Rinsho (in Japanese). 69 (12): 2121–7. PMID 22242308. ↑ Uccelli, Antonio; Moretta, Pistoia (September 2008). "Mesenchymal stem cells in health and disease". Nature Reviews Immunology. 8 (9): 726–36. doi:10.1038/nri2395. PMID 19172693. ↑ Ibelgaufts, Horst. "Cytokines & Cells Online Pathfinder Encyclopedia" . Retrieved 25 April 2013.